A few Saturday evenings ago, The Stallion and I had a low-key evening. One of his friends and his sister came over to grill out. The Stallion made smoked ribs. They were phenomenal. He cheated a little bit and boiled them until they were cooked, then put them on the charcoal grill with woodchips for an hour or so. They were amazing! They were especially amazing because I hadn't eaten anything yet that day and I had just finished mowing the lawn. While The Stallion and his friend drank beer and stood around The Stallion's honkin' man grill. I was fine with that, and it was my own doing. I really like mowing the lawn, and I ain't got nothin' on The Stallion's grill skills. Plus, I wanted to get the grass clippings out with that week's trash. So I sucked it up and mowed the back and front yard. And when I was done, dinner was ready! Now I know what it's like to be a man. But it was a glimpse. Up next - getting ready without doing hair and makeup. After dinner, we all sat on the deck to relax, sip on our cocktails of choice, and talk about, well, you know - life. And stuff. Which these days consists mostly of friends getting married, friends having babies (it's a BIG year for babies), friends buying houses, etc. etc. etc. Then, (gasp) I had a hankering for something sweet. Of which, I had nothing. I don't keep that stuff in my house. It's dangerous. And you all probably think I'm a liar. But it's true. Kinda. Because I did manage to scrounge up the ingredients for Snickerdoodles. But anybody can do that. Even you, I bet. It's the most basic of basic. But they were so, so, so good. I mean, why don't I make these more often? They were so good, I even knocked on our neighbors' door (the ones with the 10 month old) at 9:30 at night in order to rid myself of the leftovers. Because with these cookies I knew there would be no self-control. They probably thought I was crazy and a little bit weird, but they loved the cookies I delivered! And I think they're accepting of who I am. Even if it is crazy and a little bit weird that your neighbor comes over at 9:30 at night with some cookies. Your neighbor who's not married and doesn't have children. And it's a Saturday night. There she is, with freshly baked cookies, not out having a great time, doing what people in their twenties with no responsibilities do? What a true 'Laner' would be doing? WEIRD. Also, I like chocolate and cinnamon. So I decided to use the chocolate chips I had leftover from making Skinnygirl Cookies in half the batch. Which was actually a quarter of a batch because I had halved the recipe. Because it would have been even weirder had I knocked on my neighbors' door with a dozen cookies. The chocolate chip factor was phenomenal. Although, if you do it - please use dark chocolate. You will like it even better, I just know. The Stallion went straight for a chocolate chip one and devoured it. Obviously my food photo shoot is now over. The cookies are disappearing. 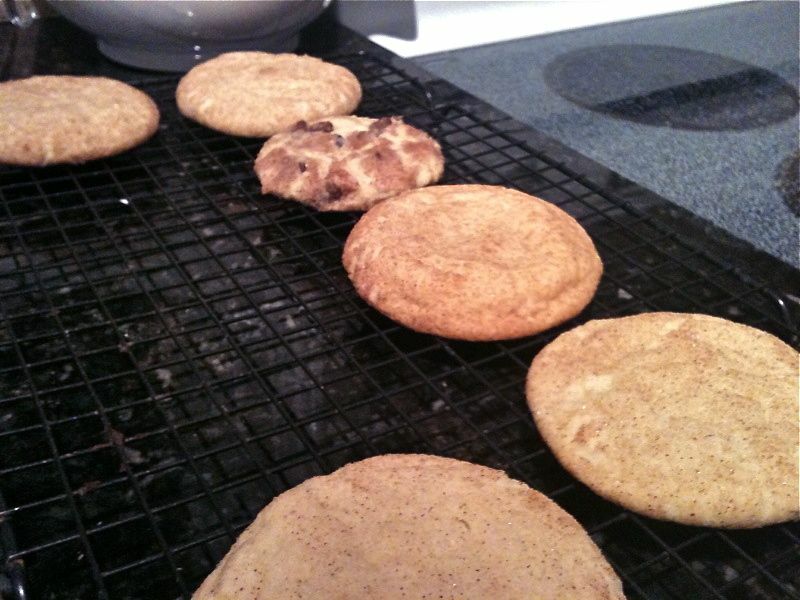 Also, regarding the cookies with chocolate chips - the second pan out of the oven had a perfect crust. It didn't break apart like the ones in the pictures. The reason? I had refrigerated the dough. (I think) So, if you add chocolate, exercise some patience and refrigerate the dough for at least 15 minutes. You'll be rewarded! I think the saying is 'You want a cookie?' Yes, yes I do! And you shall get one! With a handheld or standing mixer, beat together the butter and sugar until light and fluffy, about 5 minutes. Add the eggs, 1 at a time, beating well after each addition. Sift in the flour mixture and blend until smooth. Using a wooden spoon, incorporate the chocolate chunks. Put dough in the refrigerator for about 15 minutes. Mix the 3 tablespoons sugar with the cinnamon in a small bowl. Roll the dough, by hand, into 1 1/2-inch balls. Roll the balls in the cinnamon sugar. Flatten the balls into 1/2-inch thick disks, spacing them evenly on parchment-lined cookie sheets. Bake until light brown, but still moist in the center, about 12 minutes. Cool on a rack. 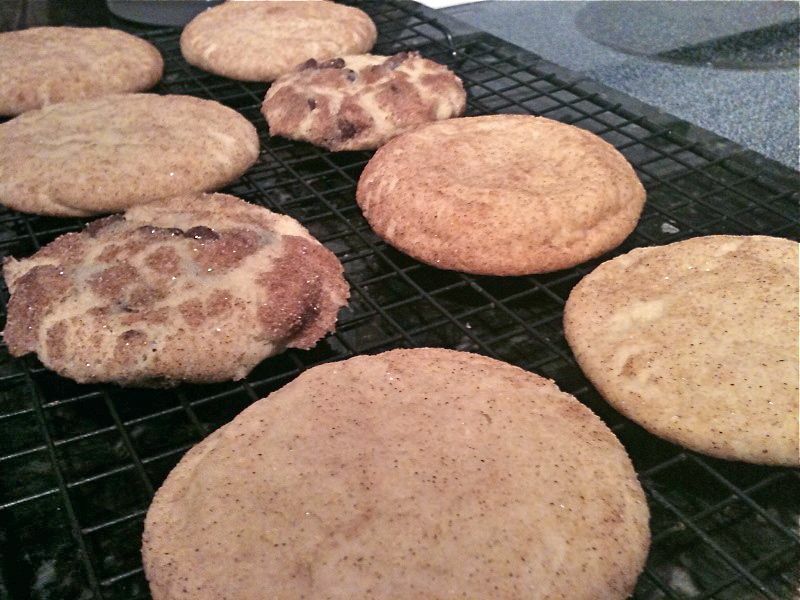 Who says you can't have chocolate in your Snickerdoodles? WHO SAYS!